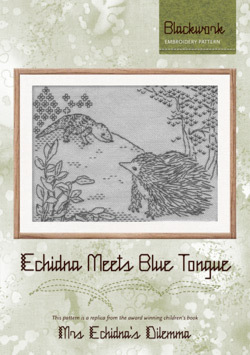 "Echidna Meets Blue-Tongue Pattern - Blackwork" is a replica of one of the illustrations in the book. This blackwork pattern contains many longer sttiches (for the spines) and some cross-stitch [for the eye] as well as the traditional blackwork of repeated patterns and running-stitch outlines. It could be completed on any even-weave fabric - the instructions give details for calculating the completed dimensions for various sizes in even-weave fabrics. The pattern contains a graph, plus detailed, well-illustrated instructions for the stitching. It is suitable for an intermediate level of experience in cross-stitch and blackwork.